Bryan Cooper claimed victory on Don Poli in the RSA Chase at 2.05pm today as the favourite won at a 13/8 starting price. 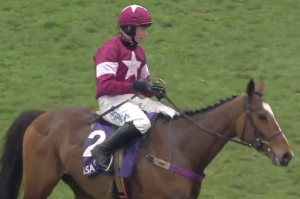 TRALEE jockey Bryan Cooper had a winner earlier today at Cheltenham. Cooper, already an established jockey at the young age of 22 claimed victory on Don Poli in the RSA Chase at 2.05pm today as the favourite won at a 13/8 starting price. It marks a happier return to the course for the jockey after sustaining a horrible injury in a fall in last year’s festival where he suffered a a double leg break. He was congratulated on Twitter by another Kerry ‘Star’ as Kieran Donaghy who took to social media congratulate the young star.